VATICAN CITY — It makes no sense to lament the problems of hunger and forced migration if one is unwilling to address their root causes, which are conflict and climate change, Pope Francis said. “War and climate change lead to hunger; therefore, let’s avoid presenting it as if it were an incurable disease,” and instead implement laws, economic policies, lifestyle changes and attitudes that prevent the problems in the first place, he told world leaders at the United Nations’ Food and Agriculture Organization. 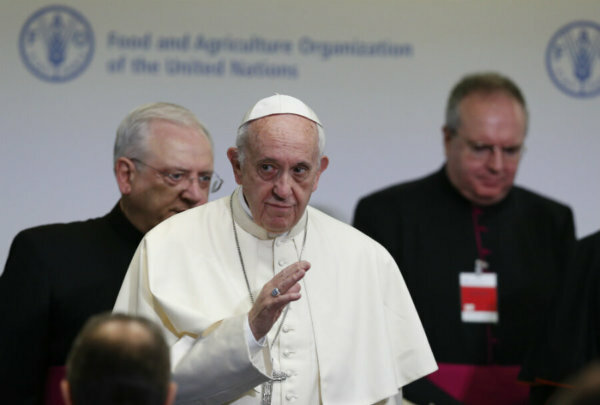 Food insecurity is linked to forced migration, the pope said, and the two can be addressed only “if we go to the root of the problem” — conflict and climate change. International law already has all the instruments and means in place to prevent and quickly end the conflicts that tear communities and countries apart, and trigger hunger, malnutrition and migration, he said. “What good is denouncing that millions of people are victims of hunger and malnutrition because of conflicts if one then does not effectively work for peace and disarmament?” he asked. As for climate change, he said, scientists know what needs to be done and the international instruments — like the Paris Agreement— are already available. Without specifying which nations, the pope said, unfortunately “some are backing away” from the agreement. U.S. President Donald Trump announced in June that the United States would withdraw from the accord as a way to help the U.S. economy. “We cannot resign ourselves to saying, ‘Someone else will do it,'” he said. Everyone is called to adopt and promote changes in lifestyle, in the way resources are used and in production and consumption — particularly when it comes to food, which is increasingly wasted. Some people believe reducing the number of mouths to feed would solve the problem of food insecurity, but, the pope said, this is “a false solution” given the enormous waste and overconsumption in the world. “We cannot act only if others are doing it or limit ourselves to having pity because pity doesn’t go beyond emergency aid,” the pope said. International organizations, leaders and individuals need to act out of real love and mercy toward others— particularly the most vulnerable — in order to create a world based on true justice and solidarity. Arriving at the FAO headquarters, Pope Francis presented a gift of a statue depicting the tragic death of Alan Kurdi (also known as Aylan), the 3-year-old Syrian boy whose body washed up on the shore of Turkey when a small inflatable boat holding a dozen refugees capsized in 2015. The statue, made of pure white Carrara marble, depicts a child-like angel weeping over the boy’s lifeless body.